Don’t I have a heart, to write a piece about an unsuccessful book by a writer who has died only recently? Mustn’t a reviewer stick to the principle that of the dead, we say nothing unless it is something good? Yes, of course. Except when the author has raised a topic of particular interest. Maurice Casey’s Jesus. 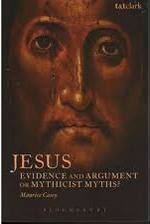 Evidence and Argument or Mythicist Myths? is such a book and if I am quite critical about it, it is because I think the author has recognized the urgency of a very serious problem that deserves much more attention.